With the Black Armory releasing on December 04, the Weekly Reset post (and other Destiny 2 pages) will be updated and posted a bit later (hopefully no later than 11 AM or 12 PM PST). 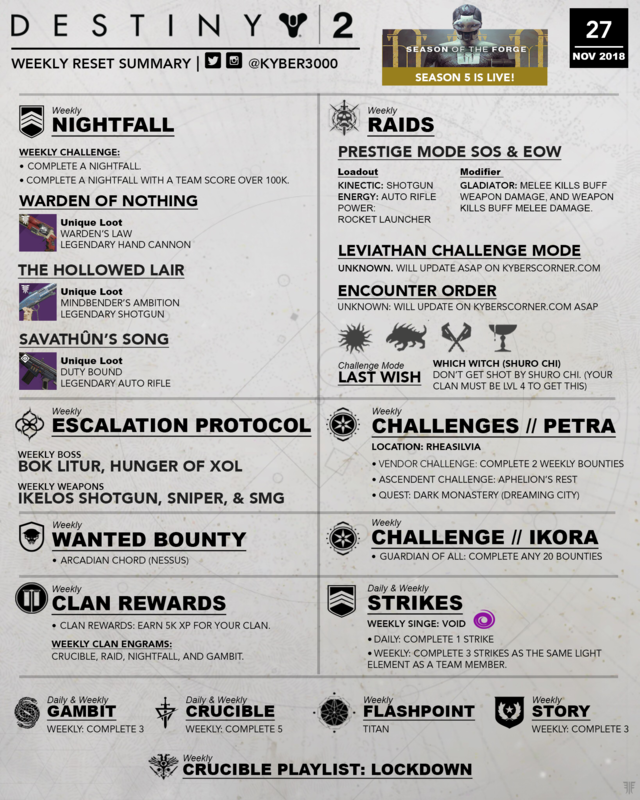 Until the post is up you may be able to find out activity details on Reddit or by visiting Niris.tv for his latest weekly reset infographic. Weekly Raid Challenge: Which Witch (Shuro Chi) – Don’t get shot by Shuro Chi. Note: No longer requires clan rank 4 to pick up with Hawthorne, as long as you have access to the Last Wish raid you may pick up this bounty. Weekly Order: Unknown, will update asap. Challenge Mode: Unknown, will update asap. Melee kills buff weapon damage, and weapon kills buff melee damage. Weekly Nightfall Challenge: Complete this week’s Nightfall. Weekly Score Challenge: Complete a Nightfall with a team high-score above 100,000. Get a highscore and earn unique weapons and exotic accessories. The higher the score, the higher your chance. Click here to learn more about Nightfall Unique Rewards. Complete various activities on Titan including public events, Lost Sectors, and Heroic adventures. Weekly Vendor Challenge: Complete 2 Weekly Bounties on the Dreaming City. 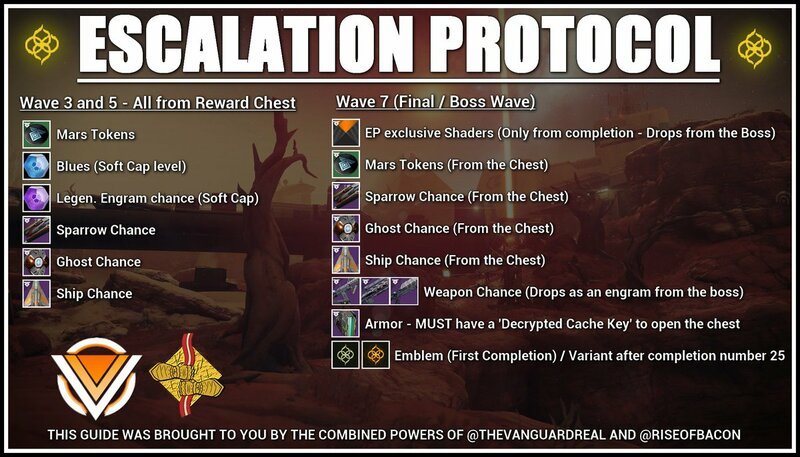 War for the Dreaming City: Complete 8 daily bounties on the Dreaming City. Dark Monastery Quest: Provide recon for Petra’s forces by investigating strange enemy activity in Rheasilvia. Ascendant Challenge: Portal located at Aphelion’s Rest. Gateway Between Worlds: Complete Blind Well on The Dreaming City to receive an offering for the Oracle. DIM (Destiny Item Manager) – Must connect Bungie account to view info on this website. D2 Checklist – May have to connect your Bungie account to view info on this website. Daily: Complete 1 match in the Crucible. Weekly: Complete 5 matches in the Crucible. Clan Rewards: Earn 5,000 XP for your clan – Complete clan bounties to earn XP. Gambit, Crucible, Nightfall, and Raid. Rewards: Each engram earned rewards powerful gear, once per week and per account. Final Boss: Bok Litur, Hunger of Xol—a black Knight with an extremely high amount of health. No major mechanic, but requires extensive firepower to take down. Weekly Guardian of All Challenge with Ikora: Complete 20 bounties of any type. Weekly Heroic Daily Story: Complete 3 Daily Story missions. Daily Heroic Adventure: Check in-game to see what the adventure is. To view daily modifiers for adventures and etc click here. 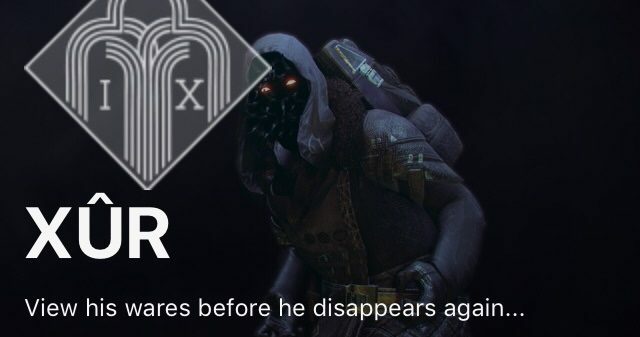 Click link above to view Xûr’s Inventory and Location on Friday’s. Welcome to the Season of the Forge. Today, there are new ranks to earn, new pinnacle weapons to acquire in Vanguard missions, Gambit, and the Crucible. We’ve also added more Triumphs and lore for you to collect. That’s just the beginning. On December 4, there’s even more on the way for every Destiny 2 player, whether you own the Annual Pass or you’ve just joined us as a brand new Guardian. Because we’re taking a new seasonal approach to our post-launch content this year, our team has prepped a new Bungie ViDoc to paint a detailed picture of the road ahead. Included in our in-depth look into what awaits you in the seasons to come is a gameplay calendar of events, activities, rewards, and updates that await. You don’t need to freeze frame to see it in full detail. We’ve included it below in all its high-resolution glory. Throughout each of our three seasons and the Forsaken Annual Pass that rolls out alongside them, we intend to keep your Director filled with things to do each week. Some of those experiences will come and go (like the Dawning and Crimson Days), but others (like the Black Armory forges and raids) remain active after their initial introduction, building on the foundation of activities you can experience each week. In the coming weeks, Annual Pass holders are in for a series of firsts. Beginning December 4, you’ll be invited to visit the Black Armory. You’ll be sent on a series of quests to rediscover, reactivate, and reclaim four lost forges—and the weapons they offer as reward. A new raid will open on December 7, and the bravest fireteams among us will make their initial runs in hopes of powerful rewards and community glory. For all players, the Dawning will light up on December 11, and of course we’ll continue to host a conversation right here on bungie.net, providing specific dates and times for all of our major beats throughout the year. If you’re looking to save the dates for our initial wave, below you’ll find a calendar charting the course for the first few weeks and casting an eye toward February. Both of these calendar graphics show our current plans, but are subject to change as development continues. As always, we’ll be right here on bungie.net, following along on socials, and in the game ourselves to make sure we’re providing you with the most up-to-date information about all the goings on in Destiny 2. See you out in the wild! Nov 27: The Road Ahead – New Seasons. New Challenges. New Rewards. Click here to learn more about Pinnacle Weapons. Thanks for reading, I hope you all have a great week and enjoy Season of the Forge! Destiny 2: The Road Ahead – New Seasons. New Challenges. New Rewards.